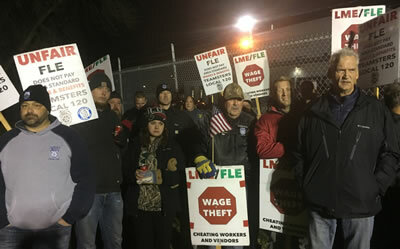 NEW BRIGHTON — As a driver backed a semi-trailer into the loading dock at the Finish Line Express freight terminal, a crowd of about 100 Teamsters Local 120 members and supporters had just wrapped up a protest rally outside the terminal on the other side of a chain-link fence. “He won’t even look over here,” said Jim “JC” Crisham, who once counted the driver as friend. Crisham was one of 95 Teamsters Local 120 members who lost their jobs — and two weeks of pay — when Lakeville Motor Express abruptly closed November 27, 2016 and the trucking company shifted management personnel, equipment and customers to a new non-union firm, Finish Line Express. The workers, who say they are owed $524,000, charge Lakeville with siphoning assets to two other operations — LME and Finish Line — “with actual fraudulent intent” to avoid paying employees’ wages. 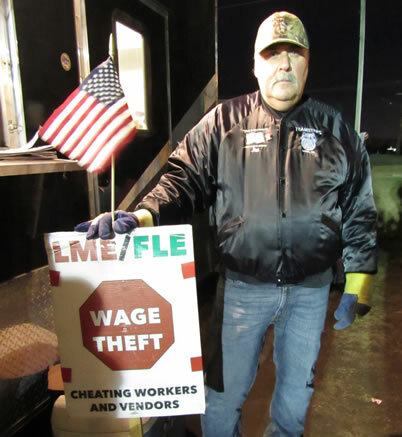 Teamsters Local 120 planned the rally November 27, 2017 at FLE to mark the one-year anniversary of the LME shutdown — and to bring attention to the workers’ unresolved claims of wage theft. November 27, 2017 rally: “What these people did to us was completely wrong. They’re crooks and thieves,” said former LME employee Jim Sperling, Forest Lake, who worked 13-1/2 years there and estimated he was owed $9,000 in pay and benefits. “They put 95 people out on the street right before Thanksgiving and refused to pay us our last two weeks of wages,” Sperling said. The workers also lost earned vacation time and employer pension contributions that were owed. Sperling went to the state capitol earlier this year to share his story and testify on behalf of proposed legislation to strengthen the state’s ability to crack down on wage theft and increase enforcement and fines. The legislation stalled in committee. With Local 120’s giant semi-trailer as a backdrop, and a floodlight illuminating the night-time rally, Local 120 president Erickson introduced several speakers including Sperling; State Representative Erin Murphy, DFL-St. Paul; St. Paul Regional Labor Federation president Bobby Kasper and New Brighton City Council member-elect Graeme Allen. “It’s going to take time but we’re going to win because we’re right and the company is wrong,” said Allen, who also is a Teamsters Local 120 member and an organizer for the Minneapolis Regional Labor Federation. The microphone then passed from one former LME worker to another. “I hope to hell, when all of this comes to an end, all of them who were involved in this… go straight to jail and spend a lot of time thinking about it,” said Will Wintle, who had worked for 25 years for LME when the company shut down. FLE trucks drove in and out of the gate while the rally progressed and workers could be viewed inside the facility moving freight around on forklifts. After the rally, people lingered and continued talking. The event was a chance for former LME workers who had worked together for years to catch up with their former co-workers, who in the past year have found other jobs, retired, or moved out of state. Several former LME workers shared their stories with a reporter. After LME’s sudden closing, Crisham said, “at first, it was what are we going to do? What are we going to do?” Like many of his co-workers, he received help from Working Partnerships — the community services arm of the Minneapolis Regional Labor Federation. Working Partnerships administered an emergency fund set up to help the workers with pressing financial needs and also directed them to other community resources. Alex Wintle, with father Will Wintle, was one of several father-son pairs who had worked at LME and lost their jobs at the same time. Alex Wintle, who had worked six years at LME as a dockworker, said he and fiancé Rylee Stewart-Carlson learned about the LME shut-down on the way home from a hunting trip. Only two weeks earlier, the young couple had just closed on buying their first home. How much did the LME shutdown cost him in lost wages and earned vacation? “When I added it all up, it was roughly $2,000,” he said. About 100 Teamsters Local 120 members and supporters rallied November 27, 2017 outside Finish Line Express in New Brighton, marking the one-year anniversary of the abrupt shutdown of Lakeville Motor Express — which left workers owed two weeks’ pay.